"We are very proud of such a high average value of orders and their continuous increase. We are happy that the cooperation with UpMenu has been so successful." Is it possible that only 4 months after launching an online food ordering system on a restaurant website and restaurant mobile app, profit and order numbers at your restaurant have increased? Certainly! Learn about the story of Numazu Sushi and see how they have increased their turnover within several months, thanks to online orders. “Numazu Sushi” specialises in creating exceptional sushi as well as Thai dishes. This cuisine offers richness of taste and an aroma that is obtained thanks to the magic of a wok and the mixture of herbs and spices. Everyone will find something for themselves on the menu - meat lovers, vegetarians, fans of spicy food or mild food. Dishes for one or for friends are available, the latter being ideal for a night out with friends or family. The restaurant offers its guests the possibility of collecting an order in person or having it delivered to an indicated address. As a result, the restaurant serves top quality food and this also applies to online orders. Finding the best system for handling online orders was one of the preconditions of this restaurant’s success. “Numazu Sushi” wanted to increase their profits. An online food ordering system was a way to achieve this goal. The restaurant obtained the ability to accept online orders under its own brand on their restaurant website. Additionally, they obtained access to an extensive system along with technical support, all within the price of a monthly subscription. The UpMenu system offers completely new marketing possibilities - automated development of a newsletter database that enables text mail and email campaigns directly from the administrative panel. Furthermore, the button located on the website (“MENU / ORDER ONLINE”) will take the customer to the active menu section immediately. This will ensure better conversion of online orders, meaning that more people visiting the website will place orders. This is a huge convenience for customers. Another step towards increasing the number of orders and profits as well as building customer loyalty, was launching a mobile application for restaurants with online orders for Android and iOS devices. The restaurant also notified its customers about their new product immediately! Promotional activities on Facebook and Instagram are not the only thing that Numazu Sushi manages regularly. Besides great marketing, they have also introduced a Facebook ordering system. Thanks to this, they have gained an additional sales channel and ensured the possibility of their customers placing orders without having to leave social media, something which seems to be a great convenience nowadays. 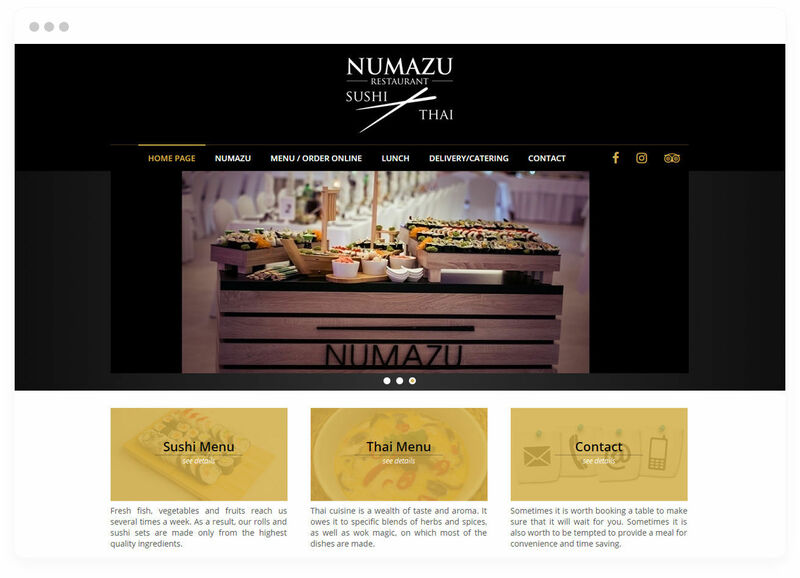 Within 4 months, Numazu Sushi increased the number of orders and conversions on the website (and continues to do so). Just after launching the online food ordering system in August, until November the number of orders significantly. What's more important is that not only the number of orders has increased but also conversions on the restaurant website. Currently, the level is 14.42%. Conversion is still on the increase, meaning that the number of deliveries is getting bigger and bigger. Four months have passed from the launch of the UpMenu system on the restaurant website and the restaurant mobile app and the number of orders are increasing. The example of Numazu Sushi evidences that even a single restaurant can achieve set goals within a short time period. Implementing these additional sales channels generated outstanding results for the restaurant, increasing the number of orders and conversions. If you want to achieve results similar to Numazu Sushi, if you are interested in building your brand and increasing loyalty among your customers thanks to online orders made through your website and mobile application, feel free to contact us! We will suggest what to do so that your sales and profits increase on an on-going basis.